Mindless Mirth: Better Rethink That! Funny, you don't seem to hear a whole lot about Global Warming any more. Maybe the "Fad" has run its course, or maybe politicians have found it's more difficult to make the public swallow crap during a COLD winter in a bad economy. Soon though, I'm sure we'll all start hearing about the next Ice Age. 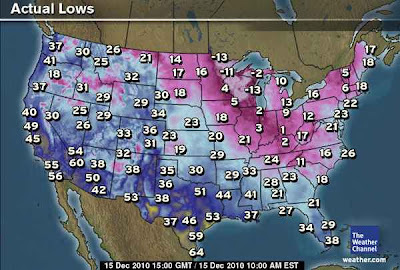 One look at the REAL U.S. temperature map shown above and you too will soon put the global warming scam to rest. Ah yes, the Swine Flu... in the graph above (click to make larger), notice the Green and Red bars... and to a great extent, the Yellow bars too? Well, those represent the "Seasonal Flu Outbreaks" from week 40 of 2010 through today. Notice how much BIGGER they are than the Orange bars? You guessed it, the Orange bars are cases of the new PANDEMIC known as H1N1, or the Swine Flu. Guess the hype about that is over too... GOOD riddance I say (oink oink). Yep, it's on its way out! The hole in the Antarctic ozone layer, blamed for global warming in the southern hemisphere, is shrinking and at its smallest for five years, New Zealand's National Institute of Water and Atmospheric Research (NIWA) said Friday. Atmospheric scientist Stephen Wood said it indicated that international initiatives, such as the 1987 Montreal Protocol, which phased out chlorofluorocarbons (CFCs) and other ozone-depleting substances, may be working. Wood said land and satellite calculations showed the Antarctic ozone hole reached a maximum of about 22 million square kilometres and an ozone mass deficit of approximately 27 million tons this year. Last year, it was 24 million square kilometres and 35 million tons. The largest ozone hole ever recorded was in 2000, when it reached 29 million square kilometres with a 43 million ton deficit. I'd say we all need to rethink all the stories we've been fed over the last couple of decades that sound like "scare tactics" or "made for ratings" style stories. Seems too many will swallow ANYTHING they're fed these days. I for one am here to debunk the myths with FACTS. Start to look more deeply into what you're told, you might be surprised. As Ann Althouse says: "When everything is evidence of the thing you want to believe, it might be time to stop pretending you're all about science."